American Safe & Vault has specialized in custom - built – solutions to meet any and all of our clients needs. Our commitment is to go beyond the standards, and surpass our clients expectations. American Safe & Vault has built its reputation on providing exceptional product at a competitive price. 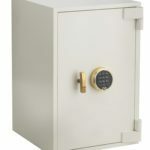 In addition to our custom designs, we have developed two series of safes that are known for their superiority in providing the highest security. The Infinity Series offers intricate locking mechanism that has a ball bearing hard plate to secure the lock from attempted intrusion. Multiple relocking devices are installed as part of the mechanism to achieve the highest standards in security. The Infinity Series Standard Safe comes with two shelves, for a more personalized safe we are offering the following options. American Safe & Vault provides emergency services with swift response and exercise extreme discretion. Our technicians arrive prepared and fully equipped to meet the needs of our customers. The most important question to ask is “can I use my safe after it has been worked on”? Yes! Our Technicians are experienced licensed safecrackers. In case we need to drill open the safe, we use professional tools to make a very small incision. The intrusion to your safe is minimum, and the drill site will be repaired. Easy access is key when you are on your way to the airport or perhaps to an evening out on the town. The Infinity Series is capable of accommodating all styles locks while maintaining user friendly status. Drawers and trays may be lined in velvet, or you can choose to upgrade to the popular Ultrasuede®. Ultrasuede® offers a wide variety of colors and patterns for those who seek a more personalized touch. The interior cabinet, and interior trim in all Infinity Series Safes are custom-built using our hand-selected stock of woods. Choose from seven of our premium wood types to build the interior cabinet of your luxury safe, or if you would like us to match a finish in your home simply provide us with a sample. You can have a left hand or a right hand swing door, that will depend on what space is available to you. Infinity Series also has a standard color chart to choose from, should you happen to fall in love with a color you may see on a vehicle. We can do that as well, simply provide us with a sample or a name and we will match it. Personalized painting and finishes are available at additional cost. The Platinum Series is designed for maximum protection of your valuables. A sophisticated mechanism that includes tempered glass plate which, when attacked, shatters and multiple relocking devices are released. Making it impossible for an intrusion to be successful. With The Platinum Series our clients may choose between a mechanical lock or an electronic lock. The Platinum Series also has a standard color chart and exterior finish. Personalized painting and finishes are available at additional cost. Interior wooden cabinetry is available with customized trays to meet clients needs. Trays are made according to the inventory provided by our client. For our watch collectors we can fit the safe with watch winders. A selection of watch winders may include automatic winders, programmable winders or rotorwind winders. For the woman on the go we have elegant door mirrors mounted securely on back of the safe door.